SABIC Italy is the market leader for small lots of plastic compounds with highly customized properties requiring specialized process technologies. 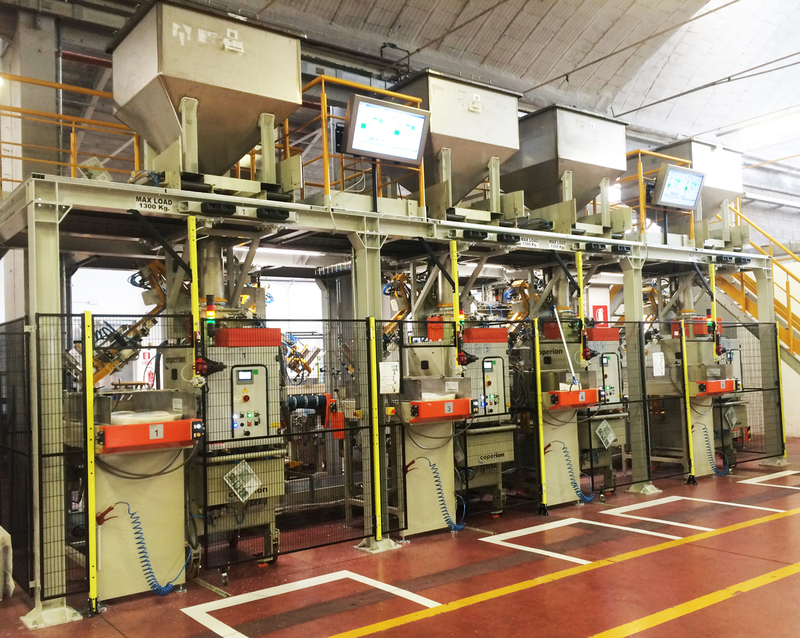 Since the beginning of the packaging lines project, the main goals were extreme flexibility and quick cleaning as well as continuous tracking via bar codes linked to the various recipes. The challenge was to install six fully automatic, robotized and flexible lines for valve bags while fulfilling the goals described above. Being a prototype concept plant, Coperion applied years of experience in this field during the design process with SABIC, building a dummy prototype in the first phase before proceeding to installation and startup of all six lines. The bags, positioned in a double stack magazine, are placed in filling position by robotized integrated pick and place arms. The machines are fed easily via bins that are placed above the machines and automatically connected to a gravity feeding funnel. Operation of the bin valve is also completely automatic. The entire process is guided via barcode readers, which identify the product batch, automatically setting all parameters on the relevant bagging machine as well as the labeling. Operators may easily identify what batch is bagged in each line via maxi LCD screens which function as remote displays for the main operator interface. The machines are placed in two rows, allowing the operator to survey the bin area and perform cleaning or maintenance tasks safely and easily. All the equipment, including the bag magazine, is designed to be moved away for quick cleaning and easy maintenance without having to interfere with the rest of the system, which remains in operation. The robotized arms remain fixed to the main steel structure. Once filled, the bags are transported via several conveyors arranged in a customized layout, fulfilling all CE requirements in terms of safety as regards interlocking and design. Finally, the bags arrive at the palletizing island, after passing a further integrated check via an online barcode, ensuring that each batch goes to the right pallet. 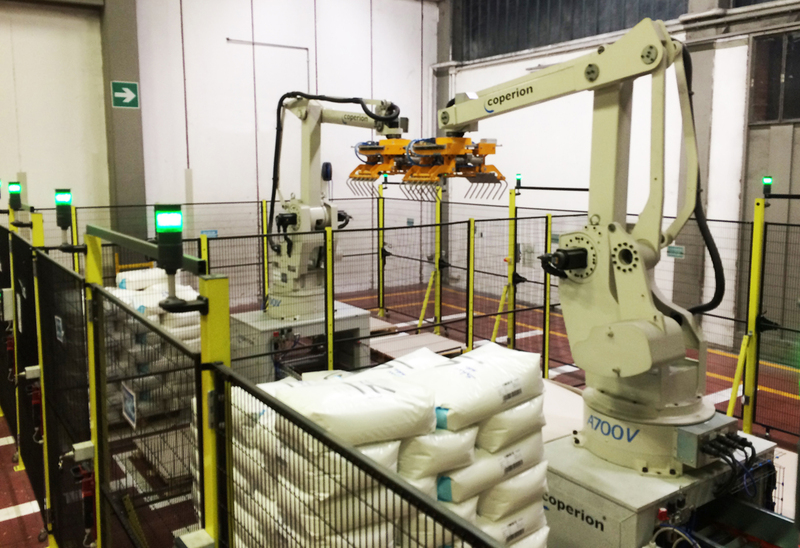 In the palletizing area two robots with four axes provide a flexible palletizing layout with real time measurement of bag height via integrated laser control. With the successful realization of this project Coperion demonstrates their full commitment to being the ideal partner along the entire process chain in compounding as well as packaging, working closely with the customer in identifying and applying customized requirements. 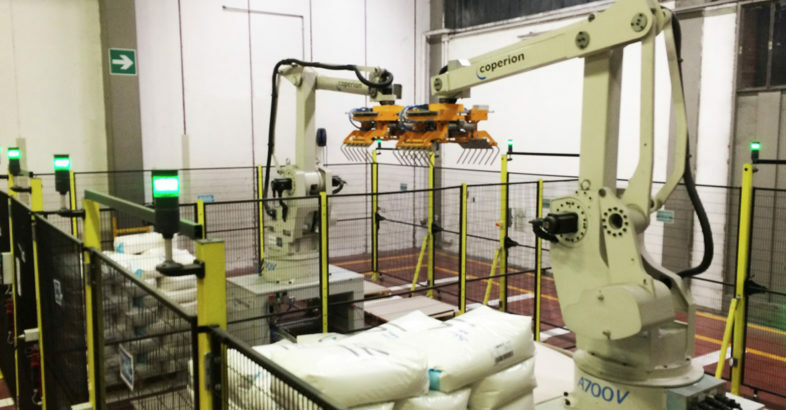 Coperion is the international market and technology leader in compounding systems, feeding technology, bulk materials handling systems and services. Coperion designs, develops, manufactures and maintains systems, machines and components for the plastics, chemicals, pharmaceutical, food and minerals industries. Within its four divisions – Compounding & Extrusion, Equipment & Systems, Materials Handling and Service – Coperion has 2,500 employees and nearly 40 sales and service companies worldwide.